Great location, great WiFi and chilled beers! The manager Sanjee was super helpful. Also great views of Ella from the rooftop! Super friendly staff and a great atmosphere! Also the staff were super helpful in organising different trips that we wanted to do around Kandy. Would recommend for sure! Stayed in a private room. Staff were very friendly. Wifi is a bit weak around certain parts of the hostel. There's an adjoining bar and restaurant next to the hostel that should help in meeting other travellers. Drinks are fairly priced. Food is underwhelming. The house dog is both massive and adorable and easily the highlight of the hostel. Location-wise, it's a bit of an uphill battle to get to so I definitely recommend hiring a moped or tuk tuk. Staff are so friendly and bar area is very relaxing after the business of the township. 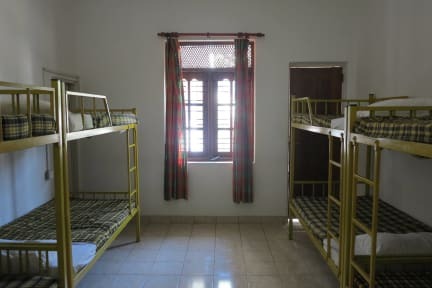 Rooms as expected for a cheap option hostel. No ac, no frills etc. 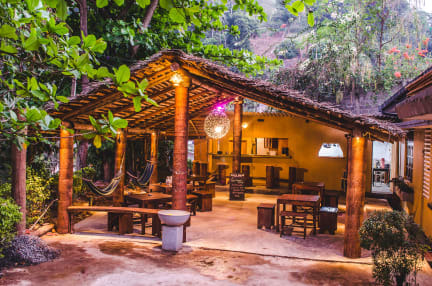 has a cool vibe, great hostel dog, cocktails are cheap and taste really nice but can take a while for service. A good hostel, and considering it was sold out it was pretty empty, which was great for people that needed sleep! The bar and eating area was great, and the food was great, and they had a fully stocked bar. The room was clean, and sheets and towels were provided. The bathroom was fine, but we did have a lot of ants in ours, something that we got used to on the rest of our trip through Sri Lanka. The staff were lovely and helpful, and the beds were comfy. The place is definitely a hostel. That being said, I thought it was fine. Affordable and convenient. Staff was friendly. I particularly enjoyed having a restaurant on site, which was also convenient and affordable. It's easy to get a tuk tuk or walk to Kandy Lake and the Temple of Tooth, which takes about 15 minutes. Starting my review with the location, it is differently distant from the city center, more like a hill like an ascent and descent of 1.7 km. The place has a great outdoor atmosphere with a good bar place to have a drink or two. However, the most troublesome part was the room and bedding. I had booked a two-bed family room. The room had foul odor which persisted for the entirety of the two days. This made it difficult staying indoors a tenuous task. Also, the beds were not of a great quality. There is basically no security at this hostel (no lock on any doors or any lockers to put valuables in. The restaurant bar area was convenient but pretty slow. Overall the atmosphere was nice and the dog was very friendly.